Beat cream cheese, sugar and cocoa together in a bowl until smooth. Add Baileys and mix until well incorporated. Set Aside. In another bowl, whip heavy whipping cream until it starts to thicken. Add Baileys, cocoa and powdered sugar and continue to whip until stiff peaks form. 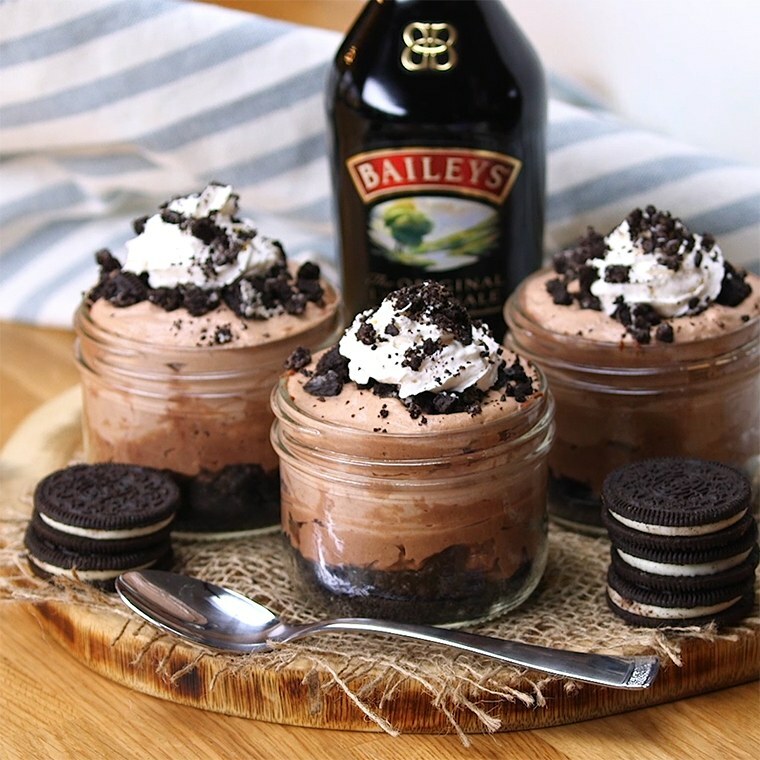 To make the trifles, divide half the cookie crumbs evenly between the four cups (or jars) and spread into an even layer in the bottom of the cups. Pipe, or spoon an even layer of cheesecake filling on top of the cookie crumbs in each of the four cups. You should only use about half of the filling. Pipe or spoon an even layer of whipped cream on top of the cheesecake filling in each of the four cups. Divide remaining cookie crumbs between the four cups and evenly distribute the second layer of crumbs on top of the whipped cream. You can keep a little big of the crumbs aside if you want to use them to sprinkle on top of the finished trifles. Pipe or spoon the remaining cheesecake filling on top of cookie crumbs, distributing evenly between the four cups. Top each trifle with a swirl of whipped cream and a few more cookie crumbs. Refrigerate until ready to serve. I recommend setting them out about 15 minutes prior to eating so that they aren't too firm. Enjoy!